Question #1 You can&apos;t drink softened water can you? Everyone can drink softened water unless they are a bottle fed baby less than 6 months old on powdered feed or on a medically supervised sodium restricted diet. The fact is unlike naturally occurring soft water, softened water has no link to increased occurrence of cardiovascular disease because it has exactly the same amount of dissolved solids in it as hard water. All we have done is exchanged calcium and magnesium metal ions that cause scale and soap scum for sodium ions that do not. Nil salt is added to the water. To put this in a sensible perspective, see health and drinking water. Softened water will make a stronger flavoured tea or coffee, you won't get a 'skin' on your cuppa and you won't get scale your kettle. Question #2 Does softened water remove existing scale? Yes. It is a fact that existing scale will quickly dissolve back into the water with softened water and no new scale will form. The hotter the water, the quicker it goes. Examples: Kettles @ 100°C around 2 weeks, whereas 12 years of scale in a hot water tank @ 60°C will dissolve back into the water in about 6 months. See how effective is it really. Question #3 Will it deprive me of essential minerals? The short answer is no. All your mineral requirements are satisfied by the food you eat, not by the water you drink. All the people who live in Cornwall, Wales, Scotland and other soft water areas do not suffer from mineral deficiency because their water is naturally soft, and neither will you when you have an Ensign Water Softener. Question #4 But it tastes salty, doesn&apos;t it? The fact is, nil salt is added to the water so no, it does not taste salty. Hard water is softened by swapping calcium and magnesium metal ions with sodium metal ions. This is done with a non-electric process called ion-exchange. We use brine to recharge the softening medium two or three times a week and when it's done it ends up down the drain, not in the drinking water. In reality, softened water tastes like a typical jug filter which also uses the ion-exchange process. Question #5 How much sodium is there in softened water? To put things in proper perspective, in a cup of tea there is more sodium in the milk than there would be in the softened water. Typical examples are two slices of bread contain 375 mg, and two glasses of milk contain 325 mg of sodium. For comparison, an adult in a average hard water area drinking 4 pints of artificially softened water per day would add only 310 mg of sodium to their average daily intake. Look at the facts in section 8 at the back of the independent Consumers Guide. Question #6 But softened water is slippery and slimy isn&apos;t it? The feeling of too slippery or slimy is a common reaction when using too much soap/shampoo/detergent in softened water. The recommendation is to use only ¼ of your usual amount. Changing your usage amount habits can take a couple of weeks, but the cost savings are worth the small adjustment. Question #7 My home has a direct feed/combi/megaflow boiler. Is this okay? Yes absolutely. The typical direct feed systems require a large flow of up to 55 litres per minute and unlike some other brands, the modern Ensign unit can handle up to a huge 81 litres per minute. The Ensign Water Softeners are regularly used in direct mains fed homes. Question #8 I&apos;ve heard that softened water will dissolve my aluminium boiler because of the salt! Metal ions in the water are exchanged for other metal ions in the water to make it softened. The non-electric process is called ion-exchange. Brine is used periodically to recharge the medium doing the actual softening and ends up down the drain. The fact is nil salt goes into the water that comes out of your tap. Because nil salt is added to the water there is nil detriment to aluminium heat exchangers used in some boilers. However, it also means that boilers in softened water will stay scale free and last a lot longer. Unfortunately this means that some people that make a business out of supplying new boilers or descaling old ones don&apos;t want this to happen and are commercially motivated to perpetuate water softener misinformation such as this. British Standard BS 7593:2006 Code of practice for treatment of water in domestic hot water central heating systems has recently been updated and now allows systems, including those with boilers with aluminium heat-exchangers, to be filled with softened water provided that a corrosion inhibitor specifically formulated for the purpose is added and properly maintained. A typical corrosion inhibitor used in boilers for softened water areas or hard water areas is Fernox. This is part of the routine boiler servicing. Question #9 Can I keep one tap un-softened? Yes, of course. In fact the recommendation is that one tap in the premises is left un-softened. If possible this means fitting a third hard water mini tap at the kitchen sink. We also keep outside taps at the rear un-softened since the garden will not notice the difference and is hence is wasted. Washing the car with an outside tap at the front however is always best in softened water. Question #10 Is the only choice heavy 25Kg sacks of tablet salt or 8Kg block salt? No, not nowadays. Since 1998 more and more people use the convenient 10Kg bags of tablet salt. They&apos;re easier to handle than 25Kg sacks and weight for weight cost a lot less than 8Kg block salt. 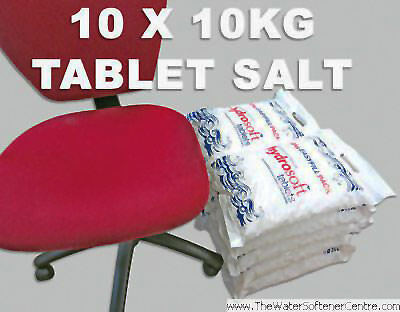 Despite the marketing hype, 10kg tablet salt can be used in all block salt water softeners to save money. See salt comparison data. Question #11 What&apos;s the minimum salt delivery and how big is that? The minimum for delivery is 10 x 10Kg bags of tablet salt. That lasts about 5 months typically. The photo shows how much space 10 x 10kg salt would take up at the back of your garage. Not much space is it? The minimum for collection is just 1 x 10Kg bag of tablet salt. Collect my salt here.